The Age-Friendly Manitoba Initiative is a comprehensive, multifaceted approach in addressing the needs of a growing seniors' population. The concept of "age-friendly" is built on the World Health Organization’s healthy aging framework, which encourages active aging by optimizing opportunities for health, participation and security in order to enhance quality of life as people age. Currently in Manitoba, 14.8 per cent of the population are 65 years and older. 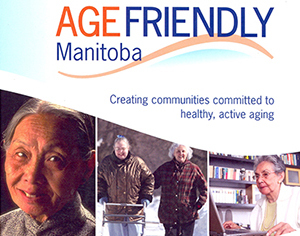 Manitoba's population of seniors is expected to increase by 43 per cent over the next 20 years. Most seniors live in the community, and as the population of seniors grows, communities will face opportunities and challenges in responding to their needs and desires.